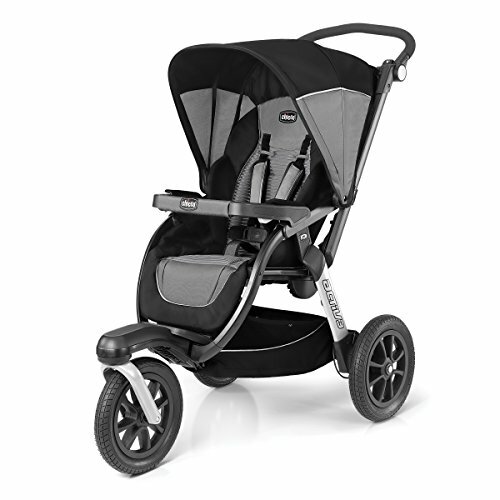 It’s been a while since Chicco offered an all-terrain stroller, but now we’re delighted to have one in the newer Activ3. 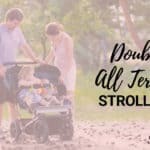 This is the kind of fitness stroller you use for both everyday outings and exercise because it is light weight and smaller rear wheels, and with all the features you need to make you and baby comfortable on your excursions. So far the reviews have been very good with average high marks across the board. Parents enjoy the versatility for light jogs and power walks, while at the same time using their Activ3 for casual outings and errands. 4 Tell me about the seat. 5 What kind of storage does it have? 10 Where can I find the best deal? This product is designed for infants and children up to 50 pounds. The Chicco Activ3 accommodates the Chicco Keyfit or Keyfit 30 infant car seat and often can be bought together as a travel system. One step activates the brakes with a levered linked system. Step down to engage, flip it back up to disengage. Safe and easy to do. The adjustable height handle goes up to 45 inches for you taller parents, giving some relief while you jog. Choose from four positions to find that angle that is just right. Good suspension is important with an all terrain or jogger to smooth out the bumps. 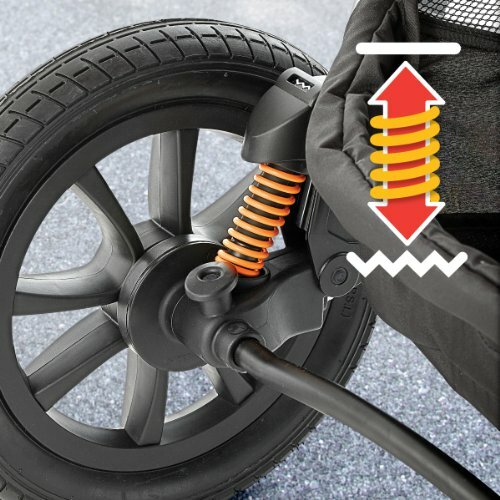 The Chicco Activ3 has an adjustable suspension that you control with your foot. Step down over each spring for the wavy line, which gives a looser suspension over rough terrain. Tighter suspension shows the straight line which is for going over the road when jogging or over smoother surfaces. 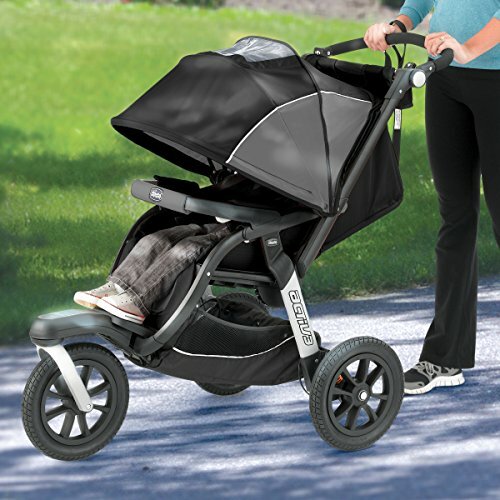 If you are a serious jogger, you might want to check out the Chicco TRE, which has a slowing brake on the handle and larger rear tires. Right now at the time of writing, the orange TRE is the same price as the Activ3. All wheels are 12-inch rubber, and you don’t have to worry about inflating them. The front wheel swivels, but if you are on a jog and want more stability, you lock it straight. What’s convenient is that the wheel lock is at the handle, and you don’t have to stop what you’re doing and crouch down in the front to lock or unlock it. The stroller is hefty and bulky like every jogger out there. It weighs 27½ pounds, which is about average for a full-sized three-wheeler. Remove the wheels easily enough for a more compact size. A parent mentioned it fit in her Volkswagon Jetta, but it was a little bit tight. Once your baby can sit up (minimum of 6 months age), he or she will be comfortable in the padded 4-position reclining the seat. I like that it’s a lever recline and can be done one-handed. While it does not lie completely flat, the seat goes to about a 45-degree angle, providing a comfortable position for napping. A padded, adjustable 5-point harness grows with your child and the lap belt can be adjusted to a larger size as well, essential for a 50-pound seat capacity. It has a tall seat back at 20″ for those bigger kids, and the width is 13″. While the buckle isn’t the most heavy-duty, it adequately does the job, and the buckle cover is a nice touch. While there is no snack tray, your child gets a padded bumper bar to hang on to, which doubles as the adapter for the car seat. It swivels or removes easily, so ins and outs are a breeze. What kind of storage does it have? Compared to similar sport strollers, the Chicco Activ3 has a storage basket that’s got a lot of space. I like how easy it is to access my things through the sides and when the seat is fully reclined, I can still access the basket. Some joggers at this price point don’t include a parent tray, but Chicco’s put one in that has two cup/bottle holders. The “tray” is made of the same fabric as the rest of the stroller. The middle compartment is more of a open-air pocket, so don’t put anything in there that might bounce out. The canopy is enormous! It has a zip-out panel to make the canopy extend all the way down to the bumper bar. The peek a boo window is at the top of the canopy when it is NOT extended, so an extra window in the zip-out panel would have been nice to have. The peek a boo window does not have a flap to cover it. The Activ3 folds easily and stands alone, freeing you to attend to other things before putting your stroller away. Simply twist the folding mechanism in front of the handle while pushing the button with your thumb and it practically folds itself in the standing position. Tuck the handle bar down all the way over the folded back canopy or have it out a little to roll your stroller like luggage. To save space, a compartment by the front wheel nose cone pops up and the front wheel collapses inward. 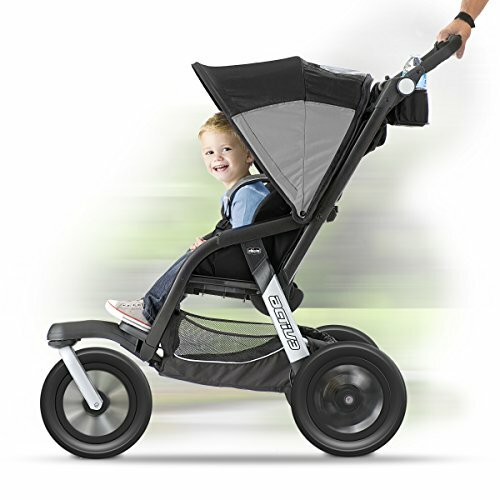 Consumers generally love the Chicco Activ3 jogging stroller and ratings across several web retailers give this product fairly good ratings. 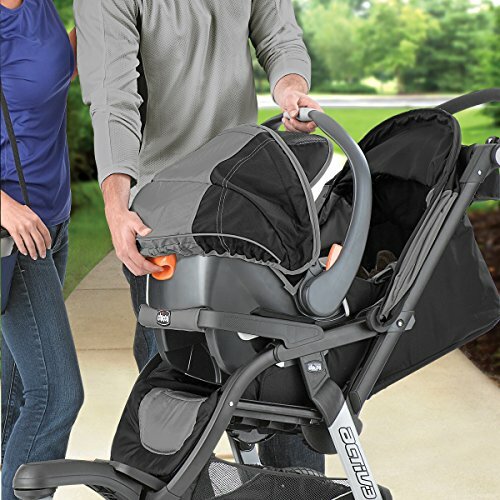 Parents appreciate the ease of use, particularly the fold, the big canopy, and smooth ride. A big hit is the adjustable handlebar. Couples who have a big height difference find this feature to be especially helpful as it allows each person to stride with ease and comfort. Many reviews mention this. Heather from Windham, ME says she’s 5’10” and her husband’s 6’3″ and that it is nice that they don’t have to lean forward to push their stroller. Most reviews on different merchant sites mention how easy this Chicco jogger is to push and steer, and how smoothly it goes. Mark says that he and his wife have taken their stroller on hikes, bumpy roads, gravel roads, uneven sidewalks and cracks in the road, and the shocks absorb every bump. 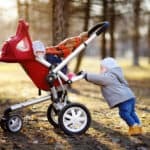 Quite a few reviews talk about how easy this stroller is to fold. We like the one-handed standing fold and the fact that the tires come off easily to save on space. The same reviews that rave about the easy fold also comment that it is bulky and you must have space in your car for it to fit, but most say that it does fit, though tightly. Lots of reviews have positive remarks about the canopy and how effective it shields their passengers. Several reviews come to the same conclusion I do: The canopy should have a mesh window to allow for better airflow. And having an extra inside the zip-out panel would make it easier to check in. A covering with magnetic closure would be a plus. The cupholder could be sturdier, according to some reviews. Some parents wish they could have a snack tray for their little one, but a Brica Deluxe Snack Pod fits on the bumper bar perfectly – the photo earlier shows one attached. Invariably, you’re going to find the best price for the Activ3 on Amazon, so I recommend checking with them first. Just imagine yourself right now taking your little one out for your own adventure with this fabulous yet rugged all-terrain jogger!